I have started my new website http://www.vstellar.com. All new posts will now be published to my new website. This blog will be running up for a few days until I am confirmed that migration of all posts/links/media items were smooth and nothing is broken in my new website. If you love to read my blogs and are following this, then a humble request to all of you is to follow my new website so that you are notified whenever I post new contents. If you come across anything broken in my new site then feel free to let me know about that so that I can fix it. Thanks for all your support as always. Today I was going through the VMware Flings website and came across one cool fling which I think can be very handy for VM Admins working on VDI. 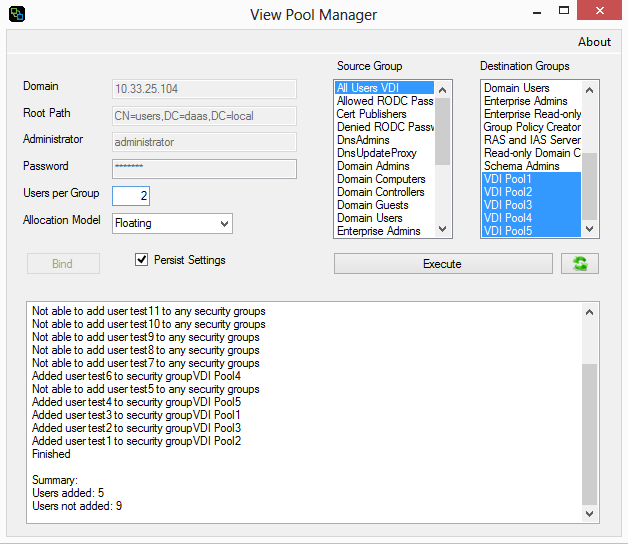 View Pool Manager is a Fling that allows VMware View administrators to easily manage users across desktop pools and security groups. Maintaining desktop pools in large VDI environment is one of the biggest challenges for a VMware View administrators. Commonly each desktop pool has Active Directory security groups with the number of users a given desktop pool will support. As employees leave/join the organization, security groups require maintenance to ensure the number of users in each group correctly match the amount of desktops available. VMware View Pool Manager allows VMware View administrators to easily manage users across desktop pools and security groups for large deployments. This tool help VMware View administrators to save hours of work adding, removing and maintaining user’s, desktop pools and security groups while ensuring each security group does not hold more users than the amount of desktops pool assigned to a given VMware View desktop pool. The View Pool Manager requires .NET Framework 4.0. The .NET 3.5 SP1 installation might require Internet connectivity to download more files. Verify that you are a member of the Administrators group on the domain. 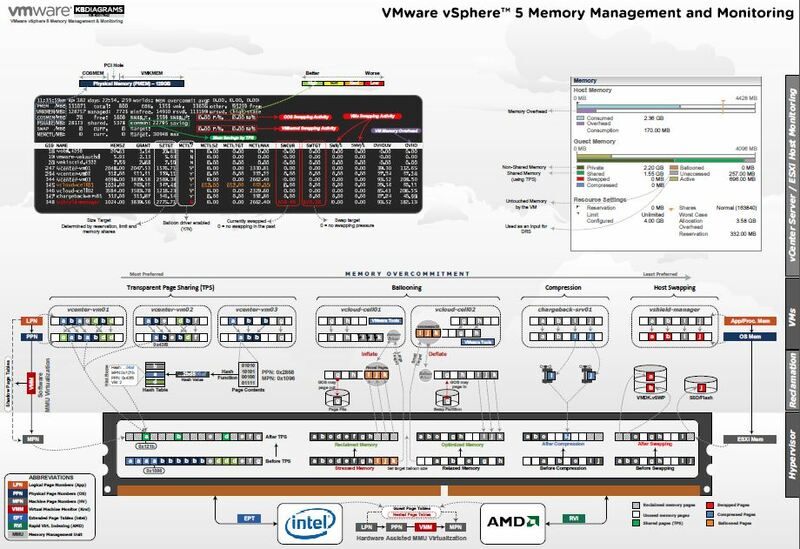 The VMware vSphere 5 Memory Management and Monitoring diagram provides VM Admins a comprehensive look into the ESXi memory management mechanisms and reclamation methods. vCenter Server is instead the most critical part of any virtual infrastructure environment. High availability of vCenter server has become very crucial as there are many features which doesn’t work or partially work when your vCenter server is not available. When vCenter server is not designed for availability it can lead to a single point of failure. There are many changes (related to vCenter Server and its components) done with the release of vCenter Server 6 and thus careful consideration has to be made in the design of its architecture. Multiple solutions can be used for achieving high availability for vCenter Server. Many of these options can be combined to provide different levels of availability. vSphere HA, FT, vCenter Watchdog services and in guest clustering solutions can be combined depending on customer requirements for availability. Availability Considerations for vCenter Server 6.0.
vCenter Server High-Availability Solutions and Configurations. High Availability for the Platform Services Controller. So guys if you are looking for deploying vCenter Server 6.0 or already deployed in your environment, then this is a must see document. In modern day physical server with two or more sockets (physical cpu) memory is distributed in a way that one slot (generally 8) of memory is local to one cpu and other slot of memory is local to the other cpu. A socket (cpu), its local memory and the bus connecting the two components is called a NUMA node. Both sockets are connected to the other sockets’ and thus allowing remote access of memory. It is not mandatory that an additional socket in a system means it is NUMA supported. Two or more sockets can be connected to memory with no distinction between local and remote. 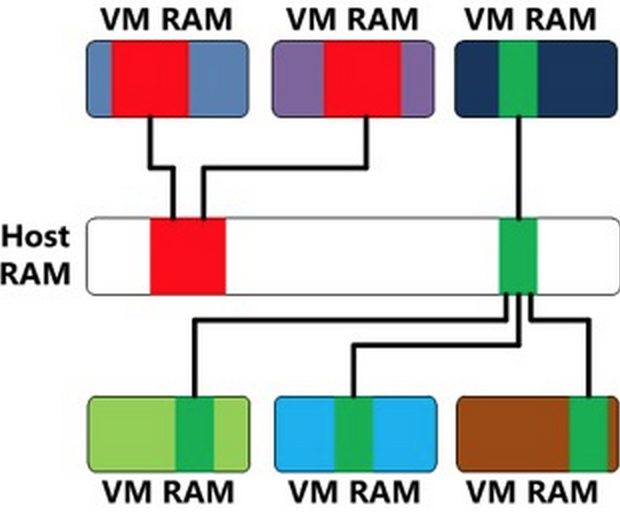 This type of architecture where one or more sockets connected to the same RAM is called UMA (uniform memory access) system. 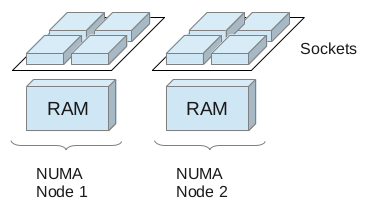 Check your server specifications for whether or not your server supports NUMA. vNUMA was introduced in vSphere version 5.0 to improve the performance of the CPU scheduling by exposing the underlying NUMA architecture of physical server to the VM. vNUMA is automatically enabled on a VM if it has more than 8 vCPU. You can also explicitly enable vNUMA on your VM even if you have less than 8 vCPU. vNUMA is designed for modern OS’s that are NUMA aware and can make intelligent page management decisions based on locality. 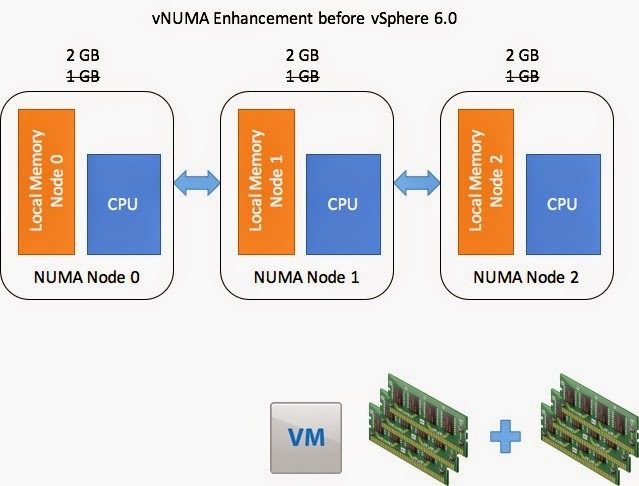 Prior to vSphere 6.0, vNUMA was not aware of how memory allocation works when a memory is hot added to a VM. Note: This post was originally posted on http://plain-virt.blogspot.in/ by Wee Kiong Tan. Let’s start with what happen in prior with vSphere 6 when a VM is hot-added with memory. We will take an example where a VM is configured with 3 GB of memory. As visible in above picture the VM memory is uniformly distributed on their physical counterpart i.e. the physical cpu present in the Esxi host because vNUMA is enabled on the VM. Now suppose this VM have Hot-Add feature enabled and additional 3 GB of memory is hot added to this VM. Memory will now be allocated by placing to the first NUMA node follow by the next if enough memory is not available to schedule the threads on previous nodes. As you can see that after adding the additional memory, the memory allocation on physical component is no longer uniform. 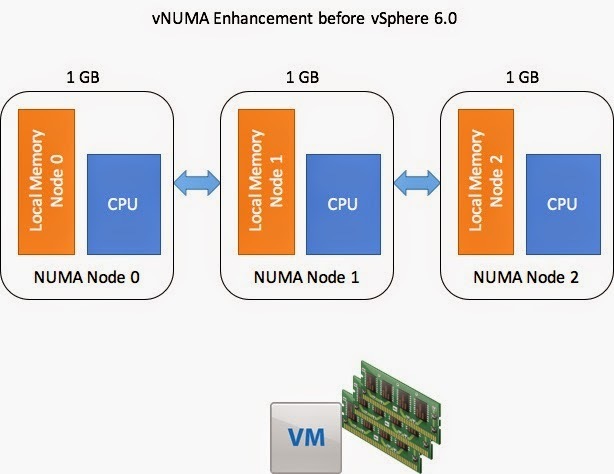 In vSphere 6.0 VMware has addressed this issue and made memory Hot-Add more friendly to NUMA. You can see in the above picture now the memory distribution is even across the physical NUMA nodes. Today I was going through a blog and found one very interesting blogpost which I am going to share with you. At VMworld 2014 VMware announced a very interesting new project called Project Fargo. This is another name for the Project VMFork. What is this Project Fargo ? Fargo/VMFork is a platform currently in technology preview which enables a rapid cloning of running VMs. It lets you quickly spin up linked clones from a VM that’s already running instead of using disk images. Rather than having a master image stored on a virtual hard disk , the base desktop is an actual running VM. When you need to give a user that same desktop, you can just clone that VM instead of booting up a whole other one. The aim of Fargo is to provides a fast, scalable differential clone of a running VM. The key benefits of using this method is that it is instantaneous and can be done from a running VM, so a new VM spawned would typically take less than 1 second and is in the same running state from where it is cloned. Also since only changed blocks are written in new VM so this solution will take up dramatically less disk space. While there are many potential use cases for Fargo, it was presented with virtual desktop in mind where providing an instant clone of running non-persistent desktop would avoid the boot storms to the storage subsystem. The forking process would be highly useful in scaling up a set of virtual machines quickly to meet increasing traffic on a website or in some other compute-intensive, high -demand scenario. Kit Colbert, CTO of end user computing at VMware, said from the VMworld stage that Project Fargo will enable production of virtual desktops 30 times faster than current rates. While we have solved the real-time application delivery problem, we still need to address the issue of desktop delivery. The reality is that today the delivery of virtual desktops is time consuming. From cloning to powering on and OS boot to customization, the end-to-end process can take many minutes before the virtual desktop is ready to accept user logins. This problem compounds itself when trying to deliver hundreds or thousands of desktops at one time. We need a better solution. 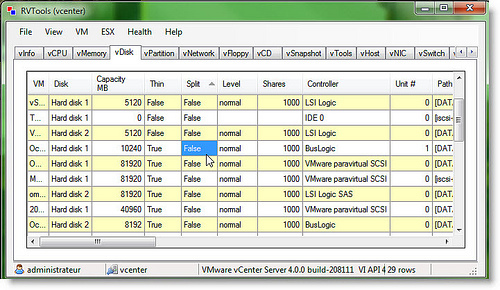 The Project Fargo feature will become likely become available in vSphere 6.0 (scheduled for 2015). It will be also possible to use Fargo features using a vCenter API. Early benchmarks show that 120 sessions can be handled on a 2 socket/8 core host with 30% less CPU consumption than same number of RDSH session. When the VM has been provisioned applications are assigned to this VDI workstation using the solution CloudVolumes, VMware claims a 30 x faster VDI provisioning. The combination of Project Fargo + CloudVolumes is internally called Project Meteor. Project Meteor is focused on delivering these desktops to any device with an HTML5-based browser. View Composer is being replaced by Project Fargo to increase provisioning upto 30x. Duncan Epping has written an excellent blog on Project Fargo. Rob Beekmans has also written a blog on Fargo and Meteor which is worth reading. Before starting with this post I would like to recall what is TPS and what it does in a virtualized environment. Earlier TPS was enabled by default to save memory space by sharing the same memory block between the VM’s running the similar type of applications. In VDI environment where most of the VM are running with same OS and contains similar applications, TPS was saving a hell lot of space and making the memory management technique more efficient. But sometimes back a research brought the darker side of using the TPS technique where it is demonstrated that TPS is a serious security threat. The research indicated that TPS can be abused to gain unauthorized access to data under certain highly controlled conditions. Even though VMware believes information being disclosed in real world conditions is unrealistic, out of an abundance of caution upcoming ESXi Update releases will no longer enable TPS between Virtual Machines by default. Starting with update releases in December, 2014, default setting for TPS will be Disabled and will continued to be disabled for all future versions of vSphere. VMware has mentioned and addressed this issue in their KB Article 2080735. I would recommend to have a look into that. Also the KB article 2091682 “Additional Transparent Page Sharing management capabilities in ESXi 5.5, 5.1, and 5.0 patches in Q4, 2014” has explained how to overcome this issue for existing version of vSphere. If your environment is not using the concept of “Large Pages” and using the default 4kb page size then TPS will be handy to save some memory blocks for you especially when the environment consists of VM’s with same type of OS and running similar application for e.g. VDI. But if your environment which consists of modern processors with MMU support (Intel EPT/AMD RVI Hardware Assist) then your ESXi host is leveraging the use of Large Pages (2MB) and by default there won’t be huge impact as TPS is not effective there (because the chances of 2 pages to be exactly similar will be very less). Also TPS is not called until host comes under memory pressure and pages are broken down to 4KB. Additionally modern operating systems like Windows 2008/2012 or Linux are leveraging security feature called Address Space Layout Randomization (ASLR), which is preventing TPS to be effective, especially in ZERO’ing when large pages are used. If you are having VDI deployments especially with floating (not dedicated) desktops into your environment and when the Esxi hosts are under memory pressure. Also if you have older operating systems prior to Windows Server 2008, then your operating systems will be using small pages 4KB by default and hence they will be benefited from TPS a lot. Also if you have disabled the use of the large pages by using advance value Mem.AllocGuestLargePage 0, then in this case you should be benefiting from TPS even in case of “modern” operating systems. If you want to check how much you are utilizing TPS then check performance tab in your vSphere client (on cluster or host level, but can be done on VM level too). In memory view look for SHARED and ZERO metrics. SHARED is all memory which is saved with TPS and ZERO is memory with zeroed blocks collapsed into one. If you subtract ZERO from SHARED you will get an actual estimate of your savings from deduplication in general. What to do if you dont want to wait for patches for disabling TPS? Although VMware believes that the reported possible information disclosure in TPS can only be abused in very limited configuration scenarios, VMware advices customers who are sufficiently concerned about this possibility to proactively disable TPS on their ESXi hosts. Customers do not have to wait for the either the Patch or the Update releases to do this. Login to ESXi or vCenter Server using the vSphere Client. Select the relevant ESXi host. In the Configuration tab, click Advanced Settings under the software section. Look for Mem.ShareScanGHz and set the value to 0. Migrate all the virtual machines to other host in cluster and back to original host. What if you want to continue using TPS after the Patch/Update? Mem.ShareForceSalting: This is a host-level configuration option. This is what disables/enables TPS on an ESXi host. If this is set to “0”, it means that TPS is STILL enabled on the host. If set to “1”, it means that TPS has been disabled on the Host, and salting is required in order for TPS to work on any VM located on that host. sched.mem.pshare.salt: This value enables customers to selectively enable page sharing between/among specific VMs. When ShareForceSalting is set to “1” on an ESXi host, the only way for two or more VMs to share a page is for both their salt and the content of the page to be same. The salt is the value specified by customers for this per-VM Advanced Configuration option. This value must be identical on all the VMs that you intend to enable page sharing for. Log in to ESXi or vCenter with the VI-Client. Select the ESXi relevant host. Look for ‘Mem.ShareForceSalting’ and set the value to 1. Power off the VM, which you want to set salt value. Right click on VM, click on Edit settings. On left hand side add text ‘sched.mem.pshare.salt’ and on the right hand side specify the unique string. Power on the VM so that salting can take effect. Repeat steps 7 to 13 to set the salt value for individual VMs. Same salting values can be specified to achieve the page sharing across VMs. IF ShareForceSalting is set to “1” and the sched.mem.pshare.salt is not set on a VM, the VM’s vc.uuid will be substituted for the salt value instead. Because the vc.uuid is unique to a VM, that VM will only be able to share page with itself – effectively, no sharing for this VM. Disk Snapshot in VMware refers to a copy of the virtual machine disk file at a certain point in time. It preserves the disk file system and system memory of your virtual machine by enabling you to revert to the snapshot in case something goes wrong. Snapshots are very helpful in the cases when you are planning to upgrade or patch your mission critical applications and servers. All the write operations are freeze on the original vmdk disk present in your VM and the new write operations will be performed on the newly created delta disk. The original vmdk file becomes read only. When a snapshot is taken on a VM certain new files are created in the VM directory. Let’s have a look on those and understand the purpose of those files. *–delta.vmdk file: This is the differential file which created snapshot is taken on a VM. It is also known as the redo-log file. A delta file will be created for each snapshot that you create for a VM. An extra delta helper file will also be created to hold any disk changes when a snapshot is being deleted or reverted. These files are automatically deleted when the snapshot is deleted or reverted in snapshot manager. *.vmsd file: This file is used to store metadata and information about snapshots. This file is in text format and will contain information such as the snapshot display name, unique identifier (UID), disk file name, etc. The size of this file is 0 byte initially until you create first snapshot of a VM. From that point it will populate the file and continue to update it whenever new snapshots are taken. *.vmsn file: This is the snapshot state file, which stores the exact running state of a virtual machine at the time you take that snapshot. This file will either be small or large depending on if you select to preserve the VM’s memory as part of the snapshot. If you do choose to preserve the VM’s memory, then this file will be a few megabytes larger than the maximum RAM memory allocated to the VM. A .vmsn file will be created for each snapshot taken on the VM and are automatically deleted when the snapshot is removed. Many of times I have seen people asking questions (in different group/communities) related to what will be the size of the snapshot delta disk when snapshot is taken and how delta disk grows. By looking into the discussion I have seen sometimes very misleading information given by the users. So let’s understand how delta disk behaves actually. The size of a snapshot file can never exceed the size of the original disk file. Any time a disk block is changed it is written in the delta file and is updated as changes are made. If every single disk block is changed in your VM after a snapshot is taken, then your snapshot would be of the same size as your original disk file. A VM’s virtual disk size is 512 GB on a VMFS volume with a 2 MB block size.In this case the maximum snapshot size would be 516 GB (512 GB + 4 GB), which would exceed the 512 GB maximum VMDK size for the VMFS volume and cause the snapshot creation to fail. So as a best practice if you are planning to use snapshots, you should always create VMs with a virtual disk size that’s smaller than the maximum VMDK size by the amount of the maximum overhead (e.g., 512 GB – 4GB = 508 GB). Initially the size of Snapshot files is small (16 MB), but will grow as writes are made to the VM’s disk files. Snapshots grow in 16 MB increments to help reduce SCSI reservation conflicts. When requests are made to change a block on the original disk, it is instead changed in the delta file. If the previously changed disk block in a delta file is changed again, it will not increase the size of the delta file because it simply updates the existing block in the delta file. The rate of growth of a snapshot will be determined by how much disk write activity occurs on your server. Servers that have disk-write intensive applications, such as SQL and Exchange, will see snapshot files grow rapidly. On the other hand, servers with mostly static content and fewer disk writes, such as Web and application servers, will grow at a much slower rate. When we create multiple snapshots, new delta files are created and the previous delta files become read-only. With multiple snapshots, each delta file can potentially grow as large as the original disk file. VMware vCloud® Air™ is a secure, dedicated hybrid cloud platform built on the VMware vSphere® foundation. It supports existing workloads and third-party applications, as well as new application development. VMware has made available the product walkthrough of vCloud Air Disaster Recovery. Auto deploy is used for PXE booting/installation of Esxi over the network. Unfortunately Auto Deploy can be configured only through command line (PowerCLI) and most of the VMware Admins are not very comfortable with command line initially. To help solve this problem there is a fling available from VMware called Auto Deploy GUI which can help you in configuring/deploying Esxi servers easily. 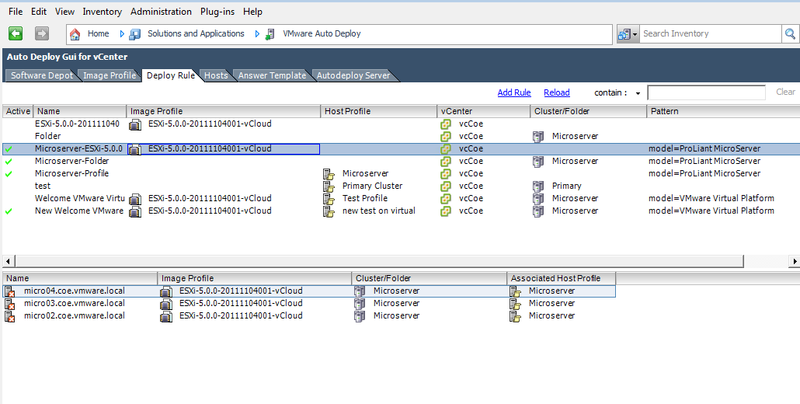 The Auto Deploy GUI is a vSphere plug-in for the VMware vSphere Auto Deploy component. The GUI plug-in allows a user to easily manage the setup and deployment requirements in a stateless environment managed by Auto Deploy. Some of the features provided through the GUI include the ability to add/remove Depots, list/create/modify Image Profiles, list VIB details, create/modify rules to map hosts to Image Profiles, check compliance of hosts against these rules and remediate hosts. Download the Auto Deploy GUI Plugin zip file, extract it and double-click the AutodeployGUI5xTP_build number.exe file. GUI to manage stateless ESXi environments. 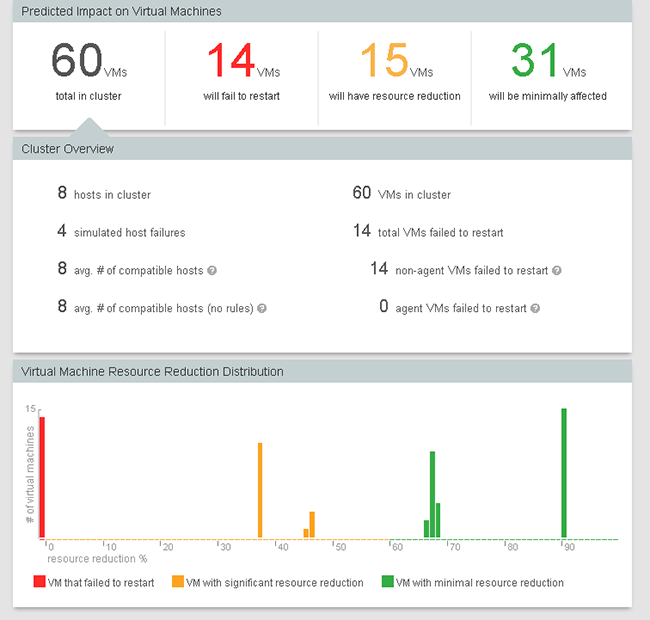 Today I was checking the VMware flings site and found one very cool fling which I think is worth sharing as it can help you analysing your environment and help you designing in such a way that resources are highly available to you in case of any disaster. The VMware View Events Database is used to record all the events that happen in a View environment. The database contains all the information but at times it can be difficult to extract those information for troubleshooting or analysis. This is a fling from VMware called “Horizon View Events Database Export” which allows administrators to easily apply very detailed filtering to the data and export it to a .CSV file. You can filter on time range, event severity, event source, session type usernames and event types. The application allows for extremely granular export of data. The exported columns can also be customized and the application will export data from both the live and the historical tables in the View Events Database. Today I was going through Vmware Resource Management Guide and found the below information and thought of sharing it across. The below information points to the faults which can occur in an environment and the reason why this fault has happened. Having knowledge of common faults that can occur in an environment can help us to understand the issue and starting the troubleshooting. This fault occurs when DRS cannot move a virtual machine because DRS is disabled on it. That is, the virtual machine is “pinned” on its registered host. This fault occurs when DRS cannot find a host that can run the virtual machine. This might occur, for example, if no host can satisfy the virtual machine’s CPU or memory resource needs or if no host currently has network or storage access needed by the virtual machine. This fault occurs when more than one virtual machines running on the same host and share affinity rules with each other cannot be moved to another host. This might occur because not all the virtual machines can vMotion off the current host. For example, one of the virtual machines in the group is DRS-disabled. This fault occurs when DRS considers migrating a virtual machine to a host, but finds that the host is incompatible with the given virtual machine. This might occur because the target host does not have access to the network or storage connection needed by the virtual machine. Another reason this fault occurs is if the target host has a CPU that differs sufficiently from the current host so that using vMotion amongst the hosts is not supported. To avoid this, create clusters such that all hosts are configured consistently and vMotion is compatible amongst the hosts. Another reason the host is incompatible with the virtual machine is that there is a required VM/Host DRS rule in place that instructs DRS to never place this virtual machine on this host. This fault occurs when the virtual machine, when powered on or moved by starting vMotion, would violate a VM/VM DRS rule. The virtual machine can still be manually powered on or moved with vMotion, but vCenter Server cannot automatically do so. This fault occurs when the host does not have enough CPU or memory capacity for running the virtual machine. This fault occurs when the host is entering maintenance or standby state when needed for DRS action to occur. To address this fault, cancel the request for the host to enter standby or maintenance mode. This fault occurs when the host hardware does not enough physical CPUs (hyperthreads) to support the number of virtual CPUs in the virtual machine. This fault occurs when the host does not have enough CPU capacity for running the virtual machine. This fault occurs when DRS cannot move a virtual machine because it is already in vMotion state. This fault occurs when the cluster in which the virtual machine is being moved does not contain any hosts that are connected and in a non-maintenance state. This can occur, for example, if all the hosts are disconnected or in maintenance mode. This fault occurs when an attempted operation conflicts with a resource configuration policy. This fault may occur, for example, if a power-on operation reserves more memory than is allocated to a resource pool. Retry the operation after adjusting the resources to allow more memory. This fault occurs when the HA configuration of CPU or memory resources reserved for failover is violated or cannot be met by the DRS operation under consideration. The host is requested to enter maintenance or standby mode. The Virtual machine violates failover when it attempts to power on. No host is available for the virtual machine that satisfies its mandatory VM/Host DRS affinity or anti-affinity rules. No host is available for the virtual machine that satisfied its preferred VM/Host DRS affinity or anti-affinity rules. DRS migration threshold is set at mandatory-only. This does not allow the generation of DRS actions to correct non-mandatory VM/Host DRS affinity rules. Finally VMware has announced the most awaited training and certification for VMware vSphere 6.0.
vSphere 6 Beta is out in market a while ago and many VMware admins have already dirtied their hands by playing around it. Now its time to get an official training and get certified on the same. The updated certifications not only provides increased flexibility and career growth opportunities but also help in increasing credibility with employers, colleagues and clients. These revisions in certification path give you more options when choosing certification levels and technology areas. This course is known as VMware’s one of the most popular certification course features hands-on intensive training that focuses on installing, configuring and managing VMware vSphere 6 that include VMware ESXi™ 6 and VMware vCenter Server™ 6. There are 3 distinct ways to attain a vSphere 6.0 training/certification and you can choose the one among the 3 that best suits your need. So hurry up and register yourself for a web based training or instructor led classroom training. Good news for all VMware Admins. 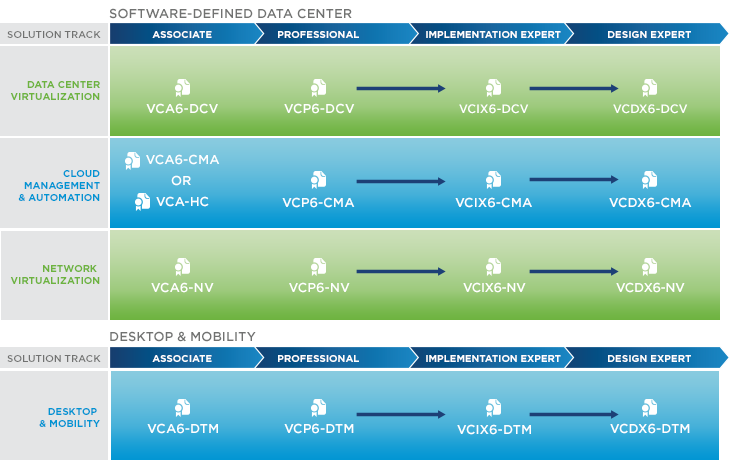 Most awaited VCP6-DCV certification has been announced by VMware today. This certification that validates your ability to deploy, configure, administer and scale a vSphere 6 virtualized data center, including administering and troubleshooting virtualization technologies. If you are running a lot of guest o.s in VMware Workstation and tired of going across tabs to power on these VM’s then there is a simpler way to do this. We can achieve this by using an application called vmrun which is part of VMware Workstation. You can find this application in the directory where your VMware Workstation is installed. You can even create a batch file if you want to power on your guest o.s with windows startup. Hope this is informational to you. Share it on social media if you find it useful. Happy learning !!! Good new for the folks who are big fan of RV Tools and use this tool quite a lot in their production environment. RVTools is a windows based application designed to use for VMware admins and it lists information about VMs, CPU, Memory, Disks, Partitions, Network, Floppy drives, CD drives, Snapshots, VMware tools, Resource pools. It also displays stats of Clusters, ESX hosts, HBAs, Nics, Switches, Ports, Distributed Switches, Distributed Ports, Service consoles, VM Kernels, Datastores, Multipath info and health checks. RVTools can be used to disconnect the cd-rom/floppy drives from the virtual machines and even update the VMware Tools installed inside each virtual machine to the latest version. A million thanks to Rob for developing such a good tool and making the life of all VMware admins easy. 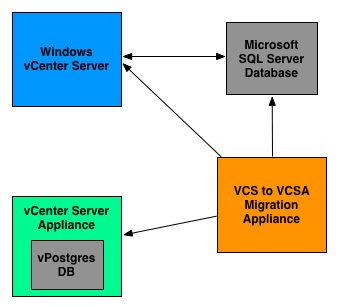 Earlier it was not possible to migrate windows based vCenter Server installation with MS-SQL database to vCenter Server Appliance with embedded Postgres DB. But now it is possible to achieve this using a fling called VCS to VCSA Converter. Here is a diagram to visualize this process. This fling is available on VMware Flings. The VCS to VCVA Converter Appliance allows customers to migrate from Windows vCenter Server with an External Microsoft SQL Server Database to the vCenter Server Appliance with an embedded vPostgres database. 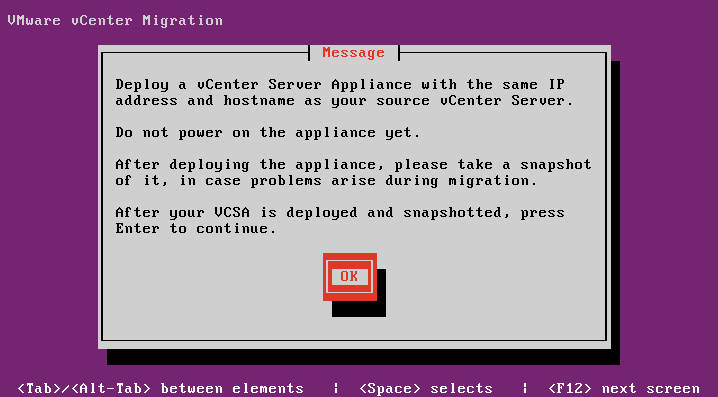 The Fling migrates the vCenter database, roles, permissions, privileges, certificates and inventory service. The target appliance will run at the same IP address as the source vCenter. vSphere 6.0 GA has been released by VMware some days back. After reading what’s new in vSphere 6.0 I am all excited to give it a shot like all other VM admins. So here are the download links and related informations to start with. If you are planning for upgrading to vSphere 6.0 from previous versions instead of new installation then I would strongly recommend to go through the upgrade recommendations by VMware. Now we are good to jump into download section. Click on vSphere 6.0 Download Links and login to My VMware with your registered user account and request for new trial to start downloading. Hit like and share this info on social media if the above information is helpful for you. Happy Learning !!!!! vSphere 6.0 GA is out now in market and I know we VM admins are very excited to get our hands dirty into implementation and learning. 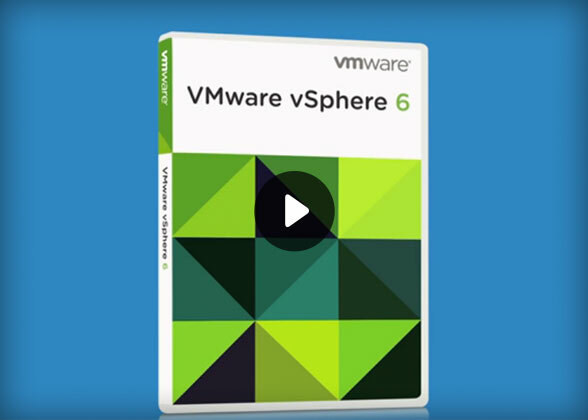 VMware vSphere 6.0 — What’s New? vSphere 6.0 public beta has been released several months ago and in 2014 VMworld conference some of the new features have been announced. Due to NDA all the features were not disclosed. Earlier upto vSphere 5.5, vMotion was limited to the vCenter/Datacenter boundary but now in vSphere 6.0 vMotion can migrate Virtual Machines across vCenters, virtual switches and routed networks. vSphere 6.0 goes one step further than resource Pools. A Virtual Datacenter aggregates CPU, Memory, Storage and Network resources. The VCSA has also been beefed up. With 5.1 you could manage 100 hosts and 3000 powered on VMs. vSphere 6 now allows 1000 hosts and 10,000 powered on VMs. Still Oracle is the only external database supported. VMware has decided to keep on the VI Client for one more release, vSphere 6.0. After that they say it will definitely be gone. Although the Web Client continues to progress and speed up, customer feedback has been that they would like to continue to use the familiar older client for now. No new functionality is being added to the C# Client so although it will be supported, it is only able to manage an ever decreasing subset of vSphere functionality. A way to centrally store VM templates, vApps, ISO images and scripts. The function is similar to the Content Library of vCAC. Content Library’s are replicated over vCenter Server instances. The advantage is a central managed repository preventing for instance severalcopies of templates of the same guest OS. 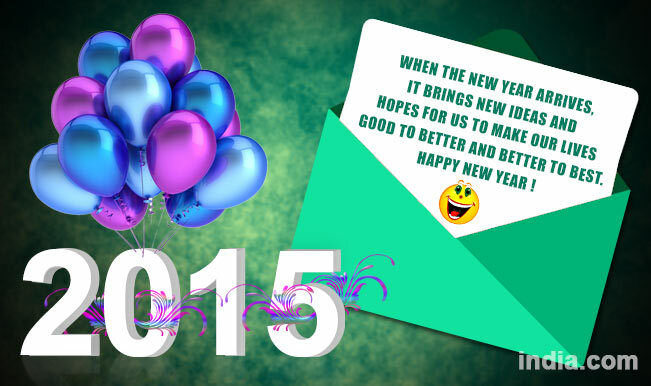 Wish all my friends and their families a very Happy New Year 2015. Last year was amazing and time has flown by so quickly. I am glad that I met some wonderful guys in this journey. I have received a lot of love and care from you guys who visit this blog and gain/exchange some knowledge. Continue your passion of learning something new everyday and keep challenging yourself every time. This year will again be fully loaded with lot of posts to share the knowledge which I acquire. This year I will be concentrating more towards some advance level things in VMware vSphere as I am preparing for advance level exams now and learning some pretty good stuff. However you guys can write me anytime if you want a detailed post on any topic in vSphere. 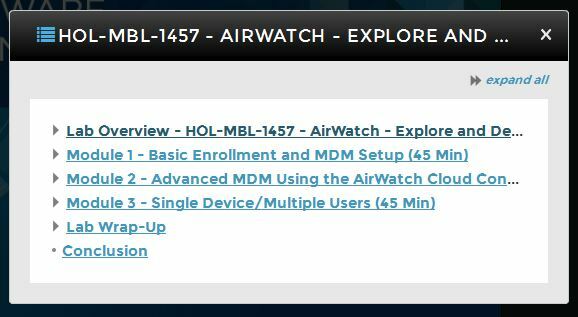 Also I have planned to learn other VMware products such as Horizon View, Log Insight and vRealize Operations Manager. Currently learning Cisco UCS and Nexus also and will share some posts on these technologies soon. Stay tuned for latest updates. There’s an easy fix to this issue. Note: The following fix is not valid if you have enabled lockdown mode for your Esxi server. Under Configuration Tab find and pick Security Profile. vCenter Server doesn’t find VirtualCenter Agent running on Esxi and deploys a new agent to server when it is reconnected in vCenter. Vmware VirtualCenter console displays handshake error. Below script is used to find the users who created or deleted the VM in the past 7 days. Note: If you want to know the count for longer period then change the value of AddDays. Below script can help you to get the count of all vMotion events that has happened in the past 24 hrs. If you want to calculate the count for longer period then change the number AddDays. The Storage vMotion events can be tracked using the below script. You can use this script to the get the count of Storage vMotion events in the past 24 hrs.